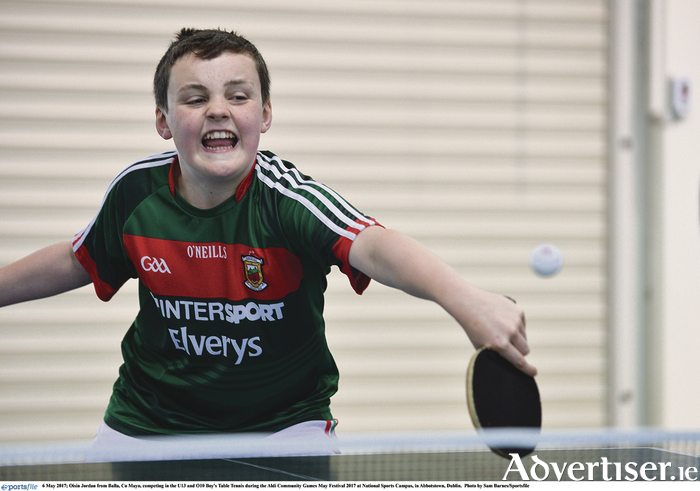 Oisin Jordan from Balla in action in the Community Games last weekend. Photo: Sportsfile. Mayo Community Games is a very proud voluntary body which has made a huge contribution to the games since they were formed in 1973. Once you entered the Sports Ireland National Sports Campus in Dublin for the National Community Games May Festival it was very clear that Mayo was truly represented by the wonderful colour of flags and Mayo tracksuits everywhere. Mayo Community Games was involved in swimming, table tennis, futsal, marathon, mixed distance relay, gymnastics, quiz, and soccer. The Mayo participants' first visit to the campus yielded tremendous success with five sets of gold medals, three sets of silver, one set of bronze, and a set of fourth place medals. Eight individual medals were successfully secured with two gold, two bronze, and one fourth place making their way back to Mayo. Pride of place must go to Balla Table Tennis which qualified for the finals with three teams and went home with two sets of gold medals and a set of bronze. The boys' U13 team of Callum Jennings, Oisin Jordan, and Darren Tansey won the gold with a win over Cloughjordan in a one sided final where Balla showed their class. Further gold medal success was to follow for their boys' U16 team of Brian and Arron Tansey and Matthew McEllen who saw off Ramelton from Donegal in their final. The Balla girls' U13 team lost their semi-final, but the trio of Lucy Connolly, Annamae Clarke, and Riona Jordan recovered to win the bronze medal. Mayo swimmers always do the county proud in the pool and the National Aquatic Centre is a second home to the Mayo swimmers. Early success in the pool came when Zara Loftus from Kilmovee won the gold medal in the girls' U16 50m butterfly. Conn McNamara who hails from Westport showed his strength to win the boys U14 50 M Backstroke. Claremorris travelled with a top class U13 medley team which consisted of James and Luke Woolley, Harry and Ben Smyth, Oran McNulty, and Peter Staunton who claimed gold in an impressive style. Colm Carney from Bohola was a silver medal winner in the boys' U14 freestyle; while Adam Murphy a noted Breaffy swimmer secured silver in the U12 50m breaststroke. Harry Smyth had a very successful day in the pool for Claremorris winning gold in the U13 medley relay and a bronze medal in the U12 50m freestyle. Evan Reilly got into the medals when he won a fourth place medal in the U14 50m breaststroke to further enhance the Claremorris medal toll. Further success in the late afternoon came when Claremorris girls' U16 medley team finished fourth after a great battle. The team members were Lisa Henry, Caoifhionn Little, Laura Finnerty, Aisling Horkan, Michelle Mulligan, and Cathy Heaney. Burrishoole Community Games is one of the best areas in the county for the past decade. There were wild celebrations when the girls' U15 futsal team won the National title with a 2-1 win in the final over Tipperary side Newport, a major achievement by the team of Eleanor, Emily, and Maggie Chambers, Maria Cannon, Jennifer Cawley, Kate McNea, Lillian Sheehy, and Lea Sweeney. There was more medals going home to Burrishoole with the girls' U21 seven-a-side soccer team picking up a silver medal after they went down to Roscrea in the final after a massive effort by Hannah Sheehy, Ava Kelly, Rachel Knox, Madeline Murphy, Allanah McDonnell, Ava and Carla Palaz, and Alice, Aoibheann, and Anna Chambers. The Islandeady boys' U15 futsal team of Liam and Rory Morris, Niall Carter, Liam Coyne, Bryan O'Flaherty, Michael O'Connell, John Vahey, and Tom Warde also went home with a silver medal in their back pocket, after they lost out to Ballyduff in the final. The 7k marathon for the U16 boys and girls is a tough race but one that Mayo has always enjoyed success in. In the girls' race Saoirse O'Brien from Islandeady put in a steady performance to win a silver medal. She was strongly supported by Emily Murray from Moygownagh and Katie Gibbons of Castlebar in the team event, but finished outside the medals. In the boys' event Thomas Devaney from Islandeady finished in third place His running mates were fast approaching with Eathon Lloyd from Westport finishing sixth, Sean Doherty from Burrishoole coming home in 10th, and Rossa McAllister from Westport in 16th. Those results saw the Mayo team pick up the team gold medal. In the mixed distance relays Mayo entered four teams. Success was secured when the girls' U14 team finished in second place to take the silver medals. It was a gruelling day for the relay teams as the semi finals were held in the morning and finals in the evening. Roisin O'Brien (Islandeady ), Ella Dealy (Turlough Towers ), Ava Flynn (Castlebar ), Willow McConville (Hollymount ), Aisling Flanagan (Breaffy ), and Moya O'Connell (Ballinrobe ) all put in a brilliant team performance. Kilmurray Quiz team were involved as Mayo champions in the U14 mixed table quiz and at the half way stage they were placed in fifth position after a number of correct rounds of scoring. Despite this they continued the good work into the second stage and eventually finished in the top 10. Well done to Shea Donohoe, Mark Gallagher, Aidan Granaghan, Aoibhe Loftus and Alaoise Mulligan. The gymnasts performed very well on the day and were unlucky not to feature in the medals. Page generated in 0.0960 seconds.